After serving in the military in several capacities and rising to the rank of captain, Hutton retired from service in 1865 and emigrated to New Zealand the following year. 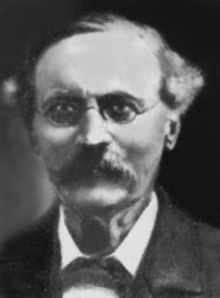 There he rose to the first rank among New Zealand naturalists, carving out a solid reputation in the fields of zoology and geology (and to a somewhat lesser degree, botany), and becoming a noted teacher, administrator, and philosophical scientist. He was an early and avid supporter of Darwinian selection principles, and used these to help explain the biogeographical and evolutionary origins of elements of the New Zealand biota. Hutton published more than six hundred works over the length of his career. --born in Gate Burton, Lincolnshire, England, on 16 November 1836. --dies at sea off Cape Town, South Africa (buried at sea), on 27 October 1905. --Oxford Dictionary of National Biography, Vol. 29 (2004). --Journal of the History of Biology, Vol. 23(3) (1990): 411-442. --Newsletter, Geological Society of New Zealand, No. 64 (1984): 22-29. --New Zealand Journal of Science, Vol. 2(7) (1885): 301-306.